ClaroRead for Windows PC supports reading and writing. ClaroRead is a simple, easy-to-use and flexible software program that helps you to read, write, study, sit exams, and increase your confidence. You can read any on-screen text out loud and improve your writing in Microsoft Word. ClaroRead Plus and Pro also let you read aloud scanned paper books and documents. AT Specialist, Cabrillo Community College. Reads Microsoft Word, Adobe Reader, OpenOffice/LibreOffice, Google Chrome and Internet Explorer with speech and highlighting so you can follow the text as it is read out by high-quality human-sounding speech. Reads text in email, webpages, and any other program you want by selecting with the mouse, pointing with the mouse, or capturing from the screen. Read paper documents with scanning (OCR). ClaroRead Plus and Pro only. Reads English, French, German, Spanish, Portuguese, Swedish and twenty-four other languages with 80 different voices and accents so you can listen to a voice you like. Choose highlighting by word, by sentence, any colour, and lots of combinations so you can get just the right one for you. Suggest words as you type to help with spelling and writing. Choice of high-frequency, many subject-specific, and huge prediction dictionaries. Phonetic prediction – type “n”, see “knowledge” suggested. Learn new predictions as you type or train it in a particular subject. Echo back text recognised by Dragon as it appears on your computer screen so you know it is right. Listen back to your text after you have written – hear mistakes you can’t spot when you read. Listen to each word or sentence as you type so you can hear mistakes immediately. Speaking spellcheck lets you select the word you want by hearing the alternatives. Support for homophones and easily-confused words like “there” and “their” and “they’re” including images to help you select the correct word. Advanced phonetic, dyslexic and problem spelling corrections like “neel” (kneel) and “necessary”. Check anywhere, in email or Google Chrome, not just Microsoft Word. Speaking dictionary for any word in any program with over 300,000 English definitions. Thesaurus to help with comprehension. Change font and text to make it easier to read. Change screen colours to reduce contrast and make reading more comfortable. Read text into an audio or video file to listen to later (on your phone, on the move, for study). Make any text displayed on the screen read aloud, including online eBooks and presentations. ClaroRead Plus and Pro only. Use industry-leading OmniPage technology to convert printed documents and image files into PDF, Word and many other formats for reading and annotation later. Create accessible PDF files with reading order. Create a portable USB pen drive version of any ClaroRead to let you use it on any computer. Reading ruler and screen colour tinter. Helps anyone who has problems keeping focus while reading. Study tool. Capture images and text from web pages and documents to help write essays and organise references. Screen colour overlay tool. Helps dyslexic students focus on the screen and read. Easy-to-use mind mapping and idea capturing tool. Download and install any of 80 voices in 30 languages. Speaking calculator echoes back numbers and results. ClaroRead Pro includes the ability to unlock the pro features in our iOS apps (ClaroSpeak, ClaroPDF and Claro ScanPen). Record lectures straight into your handouts, make voice notes, and listen back to recordings made on popular devices. Convert entire folders of documents into audio files. Convert text documents into video files. Create on-screen vocabularies to help you learn and use new words. Create symbol and text handouts to help with revision and communication. Auto Converter takes any document you drop into a special folder and OCRs or scans it automatically to create accessible versions without you needing to do anything else. ClaroRead for Word uses the latest Google Docs technologies to bring our world-class text-to-speech, spellchecking, prediction and usability tools. Quick one-page printable reference for using ClaroRead. Explains the differences between different versions of ClaroRead – Pro, Plus and SE. Complete pricelist including volume discounts. What’s new in the latest version of ClaroRead. A comprehensive listing of features in ClaroRead V7.2. Using ClaroRead in examinations, including disabling spellcheck where needed. 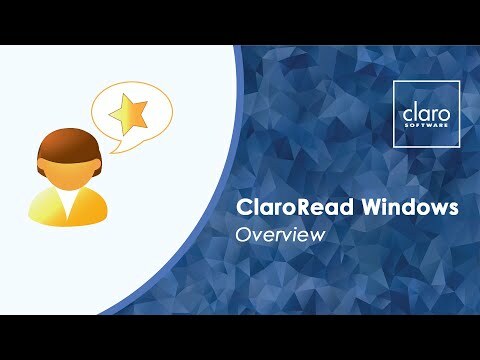 Detailed guide to installing ClaroRead on Windows networks. How to get more text-to-speech voices. You can also check out our complete pricelist. For all your Windows machines in your institution. Find out more.